At Decuypere Clearwater Chiropractic we specialize in the treatment of rehabilitating your body and mind through a variety of methods for your injury(s). The most common injury that we see is back injury. 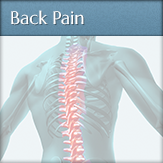 Specifically, lower, middle, and upper back pain, coming inn a variety of forms. This can be caused by pulls or strains and be very debilitating towards your everyday activities and responsibilities. Soft tissue tears undoubtedly cause back pain, often due to unreasonably heavy load or tension being pushed, pulled or lifted, and arises from the damage of various muscles and tendons. For example, improper lifting, a lack of lower back maintenance (or exercises), stretching, and exercise itself can even cause diseases such as Arthralgia (Facet Syndrome). This is when the muscles and ligaments in the back are worn down and pain or discomfort is experienced. Another common developmental injury is Spinal Stenosis, caused by negative, unnatural changes in the vertebrae that in turn pinch your back nerves (and discs) in the back, which are heavily relied on for everyday tasks. We here at Decuypere Clearwater Chiropractic take back pain very seriously, and offer a variety of approaches for treatment. Dr. Decuypere specializes in rehabilitative and integrative treatment and therapy to get your back and muscles back to primal condition. As we look at our facility as more of a health and wellness center—with a spa and variety of other amenities—we like to avoid the word ‘office’. We personalize our treatment here and encourage you to make the best choice for your back pain or injury and join our family of experienced chiropractic and physical therapists!